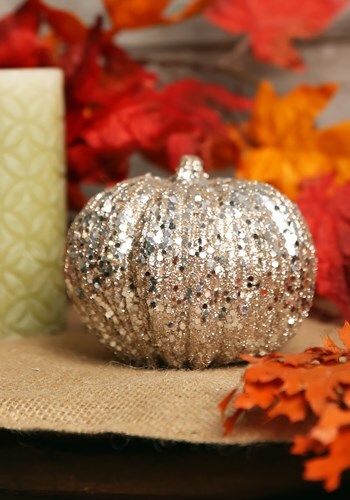 We've spent a lot of time around festive Autumn-themed accessories, and we've come up with a few basic guidelines to make decorating easier. Some of them are a little more traditional, like Rule 1: "Orange and black whenever possible." Rule 2, as you might have guessed, is simply "Pumpkins." But we also want our parties to sparkle, so Rule 3 is this: "Nothing is not improved by glitter." Depending on how we're feeling, we either make a bunch of charts to decide whether an item is going to liven up a seasonal get-together, or we just listen to our inner party animals. And our party animals are unanimous on this one! A 4.5 Inch Short Champagne Glitter Pumpkin will make a charming centerpiece or accent whether your guests are arriving in costume or something a little more formal. The tasteful champagne color will make everything around it look a little better and feel a little more effervescent. Cheers!